Quinoa pulao or pulav recipe - Quinoa pulao is just like a rice pulao prepared with quinoa and vegetables such as carrot, green peas, and tempered with some essential spices which enhances the fragrance. 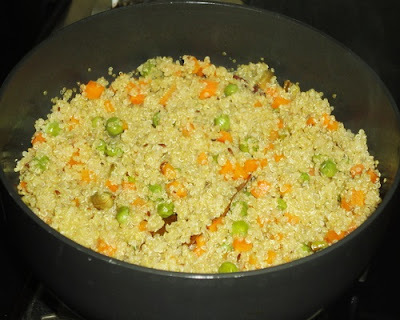 Frying quinoa and vegetables in the tempered spices intensifies the flavor. Quinoa pulao in itself is a complete meal. As I mentioned in my quinoa idi recipe, it is rich in protein and is a nutritious grain with unique flavor. I have added quinoa in my diet very recently and gradually developed liking towards it. This nutritious grain is available only in few shops and is highly priced. 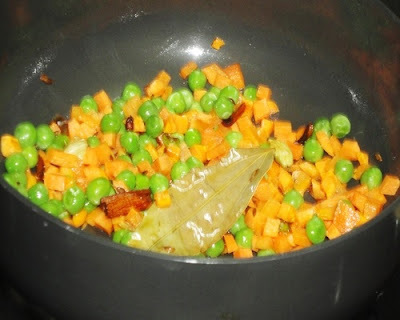 Though I have used only two vegetables while preparing this dish, any vegetable of your choice such as ivy gourds, cauliflower, french beans, potato, tomato, corn and brinjal can also be used. Try it with different combination of vegetables which are seasonal and easily available in the vegetable shops. By using quinoa, a khichdi with a different flavor and taste can also be prepared with green gram dal, onion, ginger garlic paste, coriander powder, cumin seeds powder and garam masala. In restaurant, the quinoa based dishes are not available because of its high price. However, it is worth keeping in view the health benefits associated with quinoa. The quantity of quinoa I have used in this recipe is sufficient for two servings, but you can increase the ingredients as well as tempering ingredients to make more servings. Rinse the quinoa, drain water through a thin strainer and set aside. 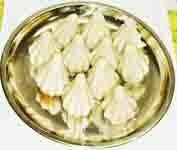 These are very tiny grains, so take care while draining the water. Heat oil in a pan. 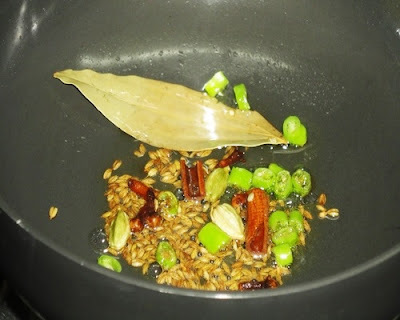 Add the green chillies, cloves, bay leaf, cinnamon, cumin seeds and cardamoms. Fry till they release nice fragrance. 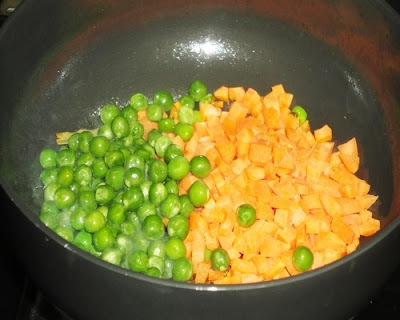 Add the carrot and green peas, saute for 2 minutes. 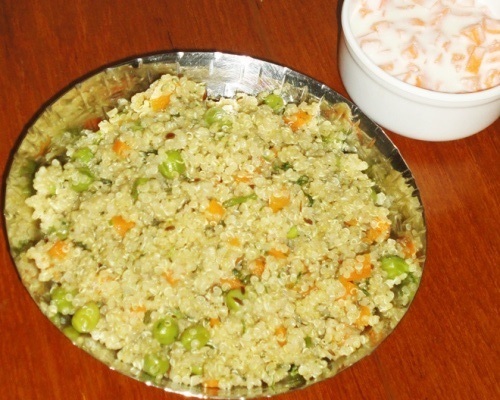 When the skin of green peas have some wrinkles, add the quinoa and saute for a while. Add salt and mix. Add 2 cups of water and mix with a spoon. Cover the pan with lid and cook till the water dries up. Check in between to prevent it from burning. 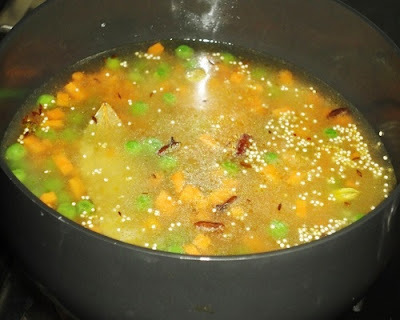 When the water dries up and quinoa become soft, add the coriander leaves and mix. 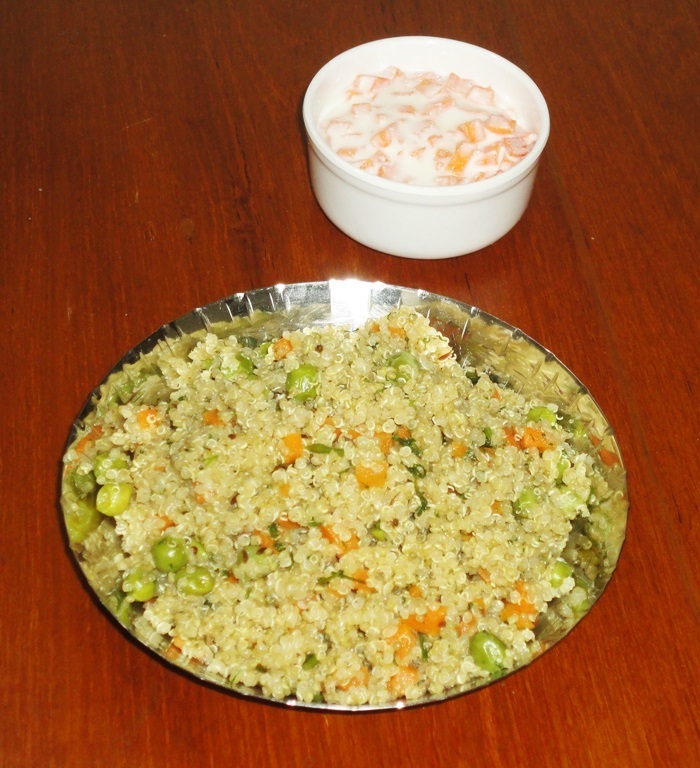 Serve quinoa pulao with papad, pickles and raita of your choice. 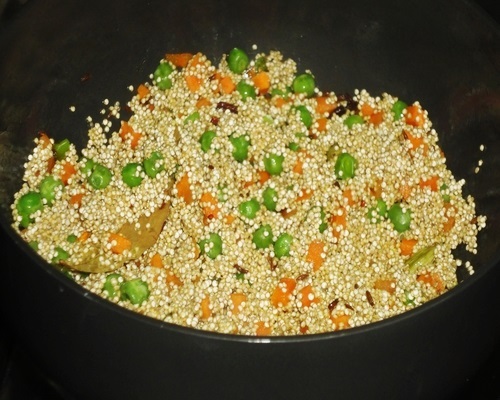 Cook the quinoa till they become soft and do not ristrict yourself from adding only 2 cups of water. Gradually add more water if required. If you add more vegetables than mentioned in the recipe, increase quantity of water to prevent the pulao from becoming too dry and chewy. Quinoa is a very tiny grain, so while rinsing and draining water, take care to prevent it from flowing through the drained water. For this purpose you can use thin strainer. 1. 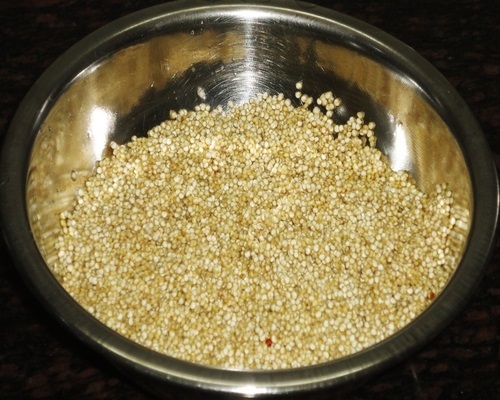 Rinse the quinoa with sufficient water, drain water through a thin strainer and set aside. 2. 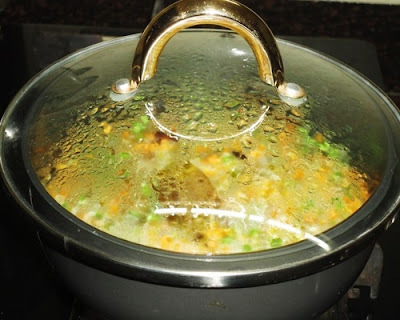 Heat oil in a pan and add the ingredients mentioned under " For the tempering" one by one. Fry till they release nice fragrance. 3. Add the green peas and carrots. You can also add some other vegetables at this stage. 4. Saute till the green peas have some wrinkles on their skin. 5. Add the quinoa and mix well. 6. Add exactly 2 cups of water and salt. Mix well with a large spoon. 7. Cover the pan with lid and cook till quinoa become soft and water dries up. 8. 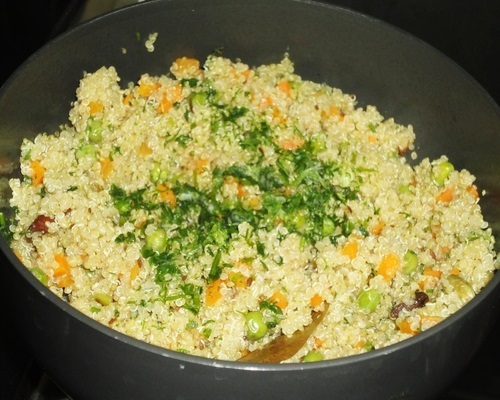 Once the quinoa become soft, switch off the flame and add the chopped coriander leaves. 9. Mix well with a spoon. Quinoa pulao is ready to serve. 10. Serve the quinoa pulao hot with papad, pickle and raita. healthy one pot meal dear,looks yum!